Dr. Keith C. Henderson was born and raised in La Jolla, CA, to Dr. Robert and Mary Kay Henderson. His father Robert Henderson opened the first Dental Practice in University City, CA in 1963. Ten years later Robert Henderson opened his second office in Rancho Bernardo, CA. Keith always knew that he would follow in the footsteps of his father to become a dentist, therefore in 1989 he enrolled as a Biology major at Point Loma Nazarene College. In 1997 he obtained his DDS degree from UCLA School of Dentistry. He is very determined and always striving to expand his skills and Dental knowledge by completing hundreds of hours of continuing education. In 1998 Dr. Keith Henderson became the Vice President and Treasurer of Henderson Dental Corporation, where he has since practiced Dentistry. During the years he has achieved many accomplishments. In 2005 he was awarded Certificate of Completion in Comprehensive Occlusion Residency from Esthetic Professionals. He was then, in 2006, awarded a Certificate of Completion in Advanced Esthetic Residency from the prestigious Las Vegas Institute for Advanced Dental Studies (LVI). Dr. Henderson is active in other professional societies, such as, American Dental Association, California Dental Association, and San Diego County Dental Society. 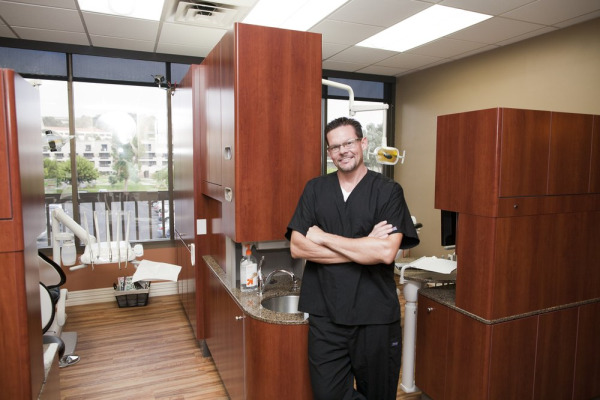 The most recent of Dr. Henderson’s accomplishments, was being voted one of San Diego’s Top Dentists in The San Diego Magazine. Dr. Keith Henderson has always strived to be the best Dentist that he could be, therefore this was a great accomplishment! Dr. Keith Henderson has another passion in life for cycling. In fact while he was attending Dental School at UCLA, he competed in Cycling and became UCLA’s first Collegiate National Champion. Dr Keith Henderson Has continued his passion and currently competes in a multitude of district Elite amateur and Masters division road cycling events. On a less competitive level, Dr Keith Henderson has enjoyed investing his time entering charity events such as the American Lung Association’s Bike for Breath. In 2009, Dr. Keith C. Henderson started his own Dental Corporation at the Rancho Bernardo office that his father first opened many years ago. Dr. Henderson has always had a passion for making improvements for the best interest of his patients, and looks forward to serving them to the best of his ability in all the years to come.